Zo Sun-il is not your usual North Korean government official. Firstly, he spends half his time outside the People's Republic, travelling around Europe and other parts of the West, or in Salomo, a small town in rural Catalonia. More importantly, though, he is not Korean and doesn't speak the language. His real name is Alejandro Cao de Benos and he started as an IT professional before launching into his illustrious career in the service of the Democratic People's Republic of Korea (DPRK) as it's official spokesman (and apologist) in the West. Cao de Benos'interest in DPRK started in his teens when he came across a North Korean delegation at a World Tourism Organisation exhibition in Madrid. He was awe struck by the delegates and made up his mind there and then to get as closely involved with the Hermit Kingdom as a Westerner could. After badgering the North Korean authorities for over a decade he was finally granted permission to launch the country's first website in 2000. His struggle to ingratiate himself with the regime took some persistence. 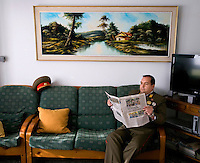 'Imagine you're bringing flowers every day to a girl and she's always rejecting you' the portly 37 year old recalls, clad in a medal-bedecked khaki uniform typical for senior North Korean officials at his home in Salomo. The website soon became the only readily accessible resource for people outside North Korea to find out more about the country and express their admiration and support for the regime. Cao de Benos proceeded to invite the people who had accessed and signed up to the website to join him in forming the Korean Friendship Association (KFA), an organisation he now claims to have some 15,000 members.